Ingredients: Serving Size: 1 bag, 0.7 oz (20 g) Amount Per Serving % Daily Value� Calories 90 Calories from Fat 35 Total Fat 4 g 6% Saturated Fat 0.5 g 3% Trans Fat 0 g Cholesterol 0 mg 0%Sodium 160 mg 7%Total Carbohydrate 7 g 2% Dietary Fiber 3 g 12% Sugars 1 g Protein 8 g 16%Vitamin A 3% Vitamin C 6% Calcium 4% Iron 10% �Percent Daily Values are based on a 2,000 calorie diet. Your daily values may be higher or lower depending on your calorie needs. 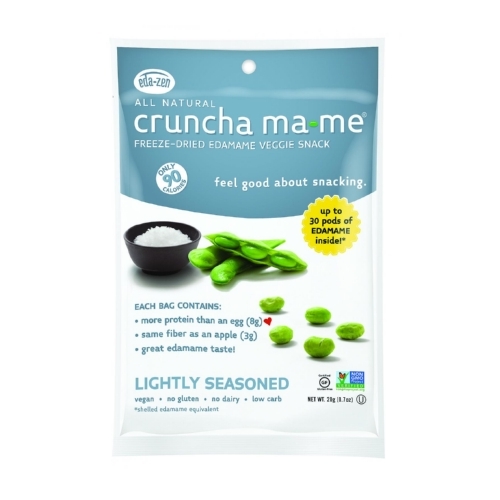 Ingredients: Edamame, sea salt, all-natural yeast extract.